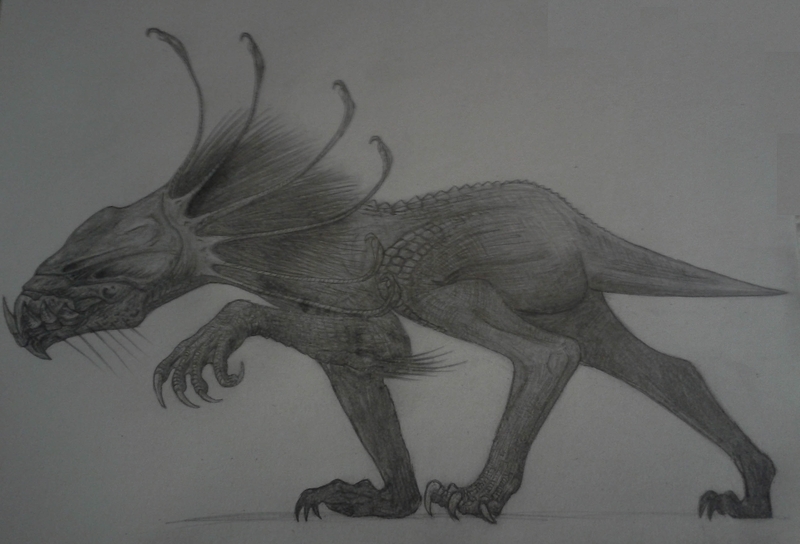 Hi all, just a quick sketch of an alien creature for the art contest. This is an apex predator, a nocturnal hunter, the ancestors of which were troglobites, evolving in the subterranean depths of a dark, dank, murky world. It has a scaly hide to retain moisture as it ventures from its underground lair at night, scouring the surface for prey. It also has a number of distinct features. Around its head is arranged a number of barbed bioluminescent lures, which it uses to hypnotise its prey in the black moonless nights of its home world. Its shoulders and upper back are covered in bristles, which all have bioluminescent tips. The creature can move them in unison, in waves, which also acts to confuse prey. For cave dwelling prey that have no eyes, and therefore cannot see the hypnotic display, the bristles can also be rattled, thus confusing a prey animal's auditory senses. They also act as highly sensitive vibrissae or whiskers, allowing the predator to detect and assess its immediate surroundings. As the creature has no eyes it uses a number of methods to navigate and locate prey, including echo location, thermal sensing and magnetoreception.